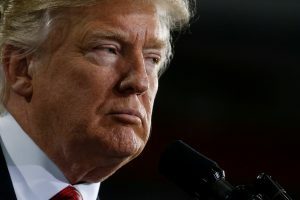 TRENTON, N.J. — President Donald Trump might not make it on the ballot in 2020 in New Jersey if he doesn’t disclose his tax returns under a bill approved by lawmakers. It now heads to Republican Gov. Chris Christie, a longtime Trump ally, to sign or veto. Christie’s office declined to weigh in. The vote comes after MSNBC obtained and revealed two pages of Trump’s 2005 tax return that showed he earned $150 million that year and paid $38 million in income taxes. Last week, Hawaii became the first state to send similar legislation to a full floor vote. At least 23 states are considering similar bills, according to the National Conference on State Legislatures. Democratic Assemblyman John McKeon, who sponsored the measure, acknowledged it’s unlikely Christie would enact it, and he’s banking on the two-term Republican governor’s successor being a Democrat who would. “This will be the law. If this governor doesn’t sign it the next one will. This is about whoever is going to run for president prospectively,” McKeon said. New Jersey Assembly Republican Leader Jon Bramnick sought on the floor to amend the bill to require state lawmakers to also disclose their taxes but was blocked by Democrats. GOP Assemblyman Jay Webber had the sharpest critique of the legislation, arguing the constitution requires only three things of prospective presidents: that they be natural born citizens, at least 35 years old and 14 years a resident. McKeon countered that the 2000 Bush v. Gore Supreme Court ruling established states have latitude in governing ballots. The measure requires presidential and vice presidential candidates to release five years of federal tax returns to appear on the ballot. Trump broke with nearly four decades of tradition by failing to release his tax returns. Left: President Donald Trump delivers remarks Mar. 15 at the American Center for Mobility for American Manufactured Vehicles in Ypsilanti Township, Michigan. New Jersey passed a bill Thursday would require Trump to disclose his tax returns in order to appear on the state's 2020 ballot. Photo by REUTERS/Jonathan Ernst.